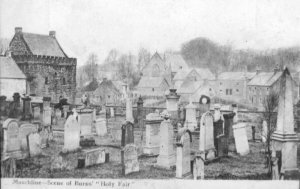 LFFT: An old view of the Parish Church, showing how open the churchyard could be if all the current growth and brushwood was to be cut back, showing how grand the building really is, and dominating the town centre. 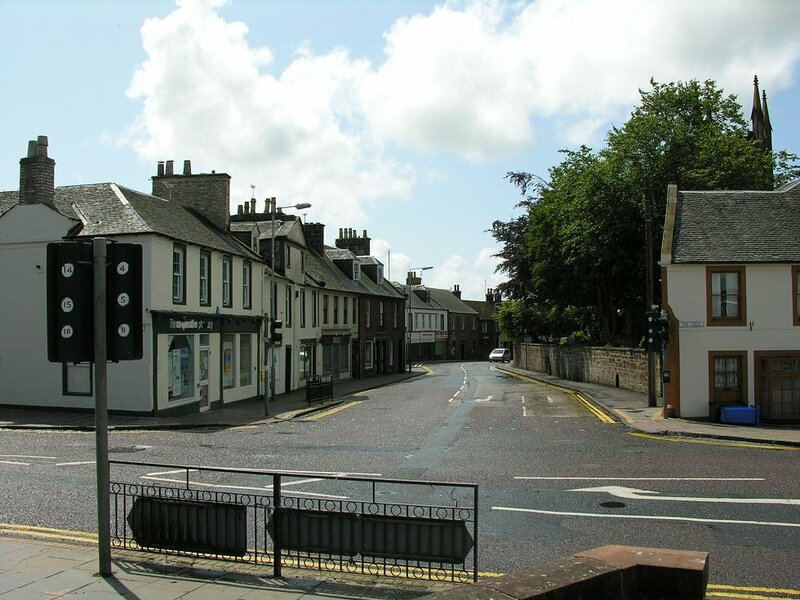 Unfortunately today it is an attraction for vandalism, for which the brush and scrub gives excellent cover. 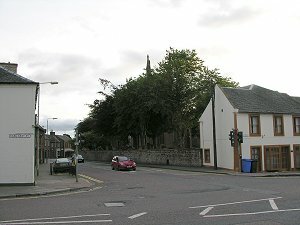 RIGHT: Image taken in August 2009 showing just how much the church is hidden from view nowadays. Trees may be nice, but on this spot they hide a majestic large building from its prominant place in the town. Photos taken in July 2009 from a similar angle to the above early photo. 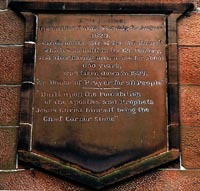 Left: This plaque which is quite a way above the church door, is difficult to read from the ground. 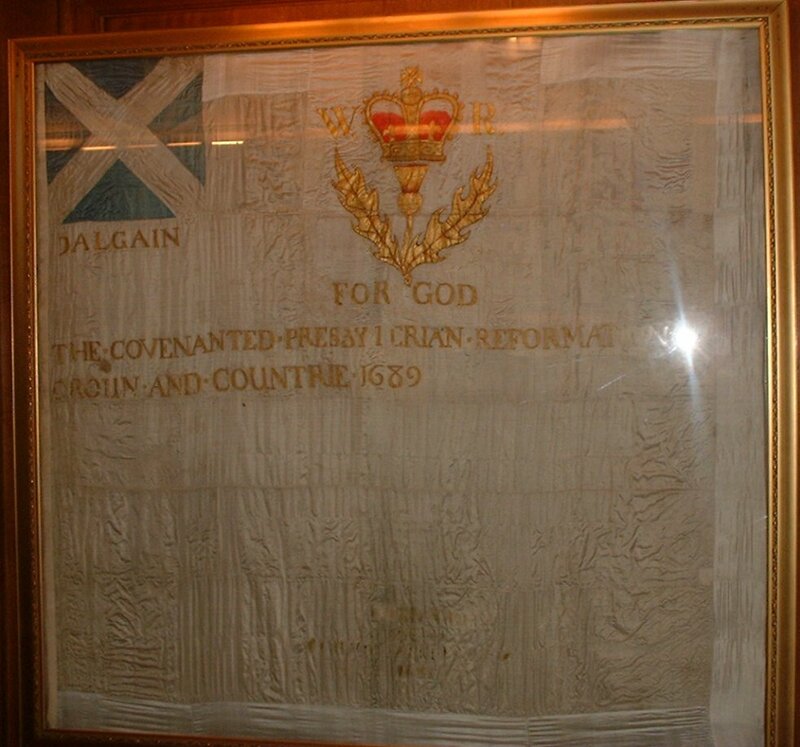 Click for a higher res readable version. 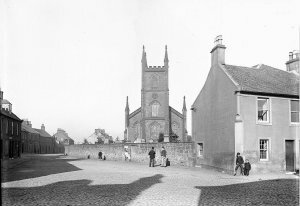 Right: An image of the Parish Church from before 1906. 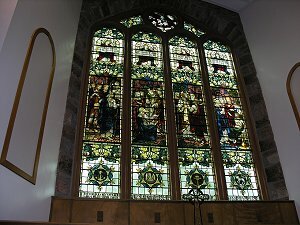 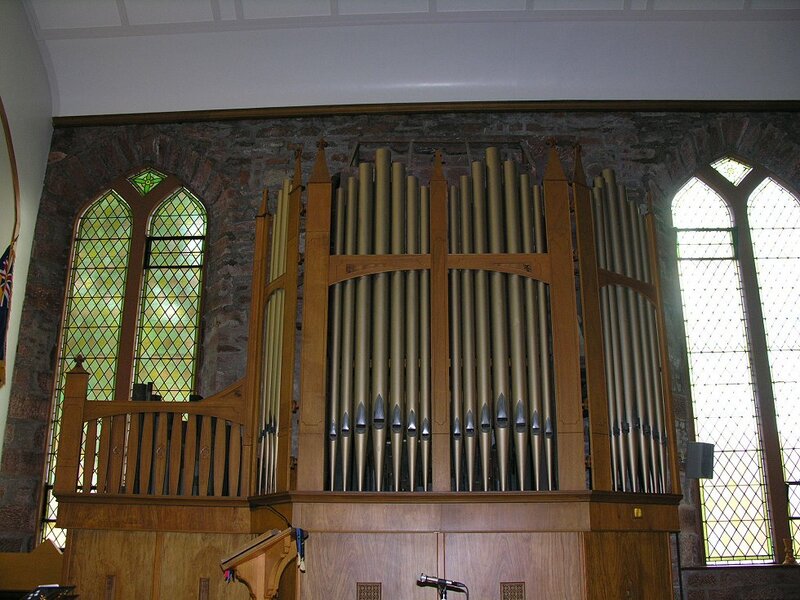 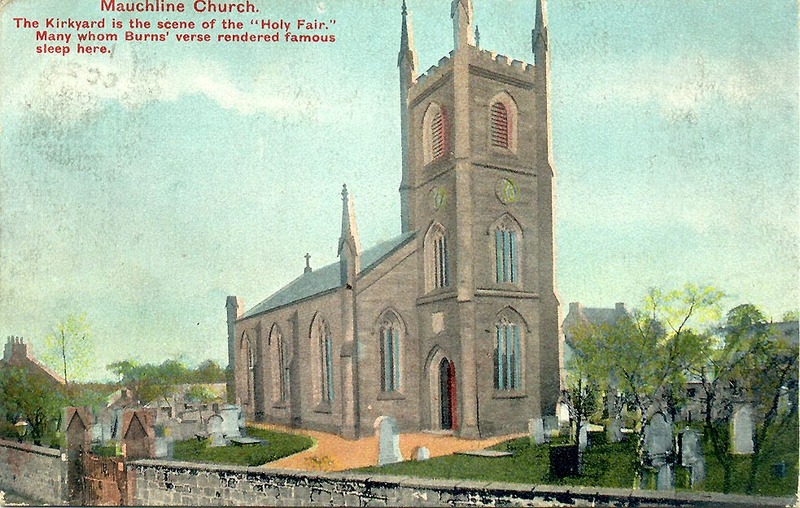 The church was opened for worship on 2nd August 1829. 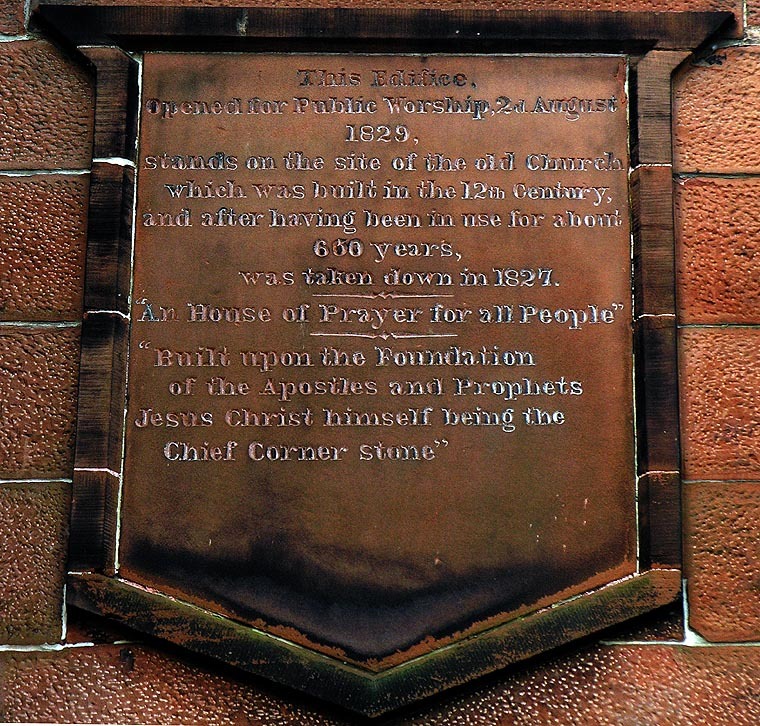 It stands on the site of the old church which would have been very familiar to Burns and his wife. 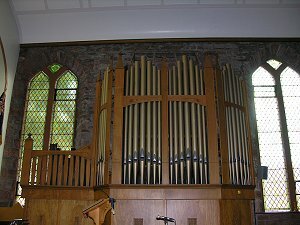 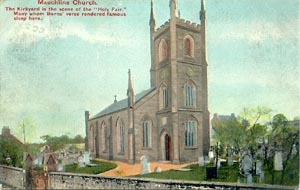 The old kirk was take down in 1827. 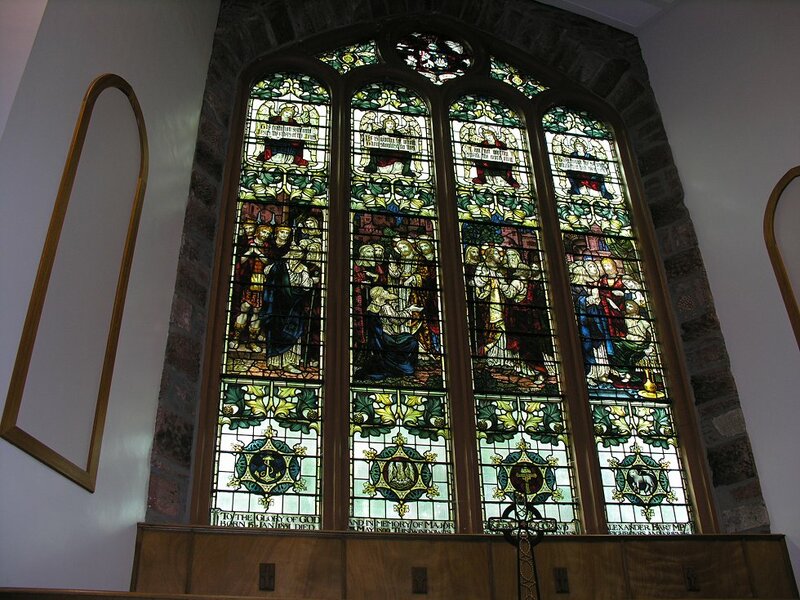 Inside the Parish Church, the Organ, and right, the impressive old stained glass windows. 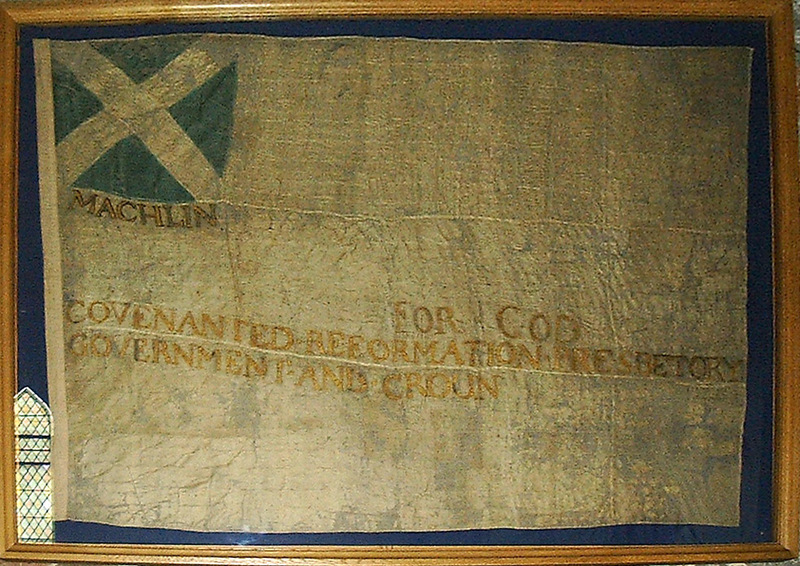 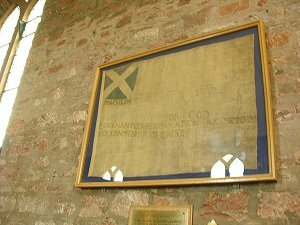 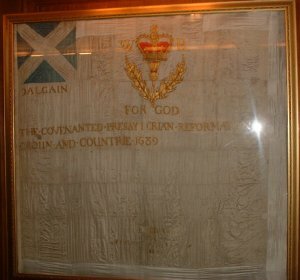 Inside the Parish Kirk, hung on the wall is the old covenantor's flag dating from the late 1600s. There is another hanging in Sorn Castle. 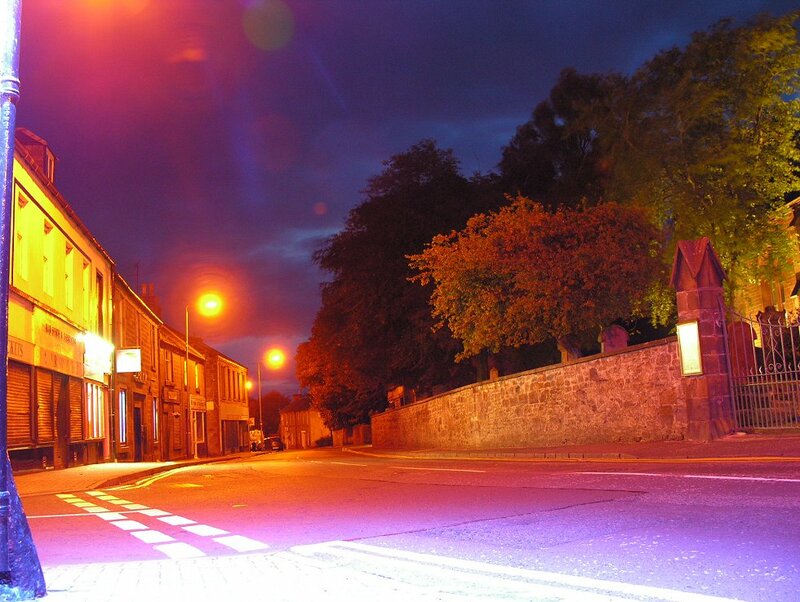 The two are photographed above, although both are in a difficult place to take a good snap. 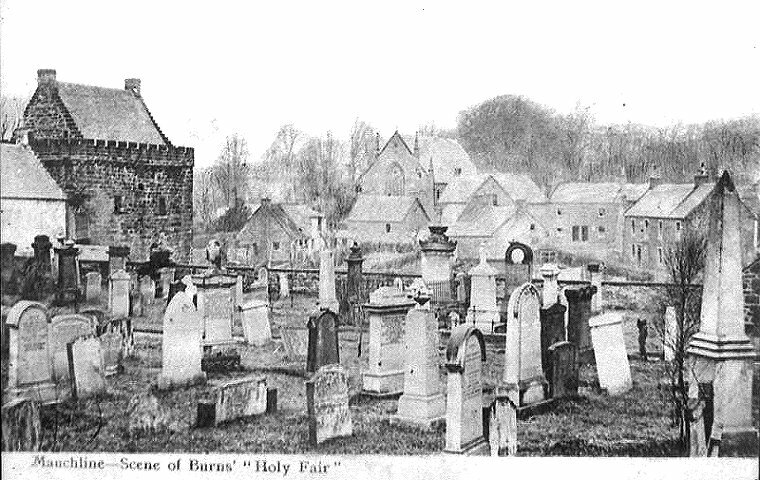 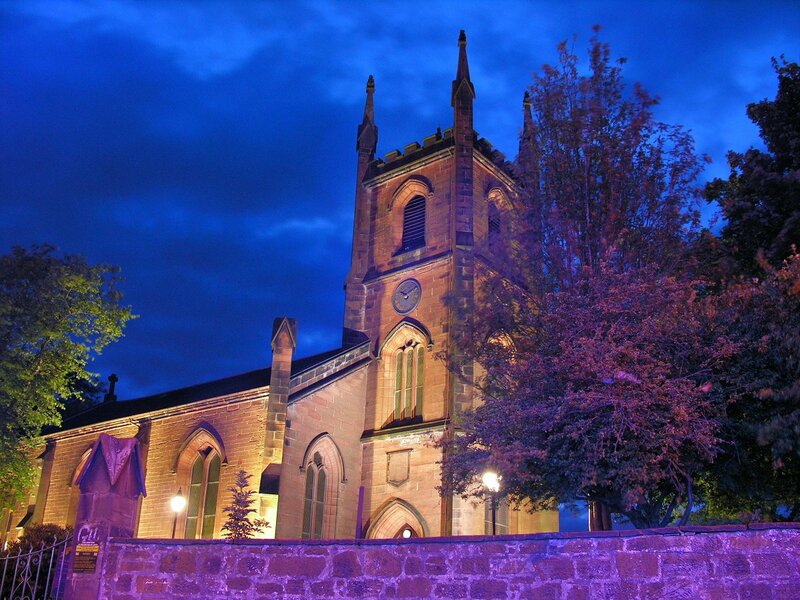 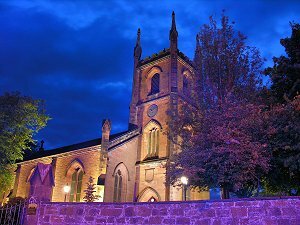 Mauchline Kirkyard, scene of Burns' Holy Fair. 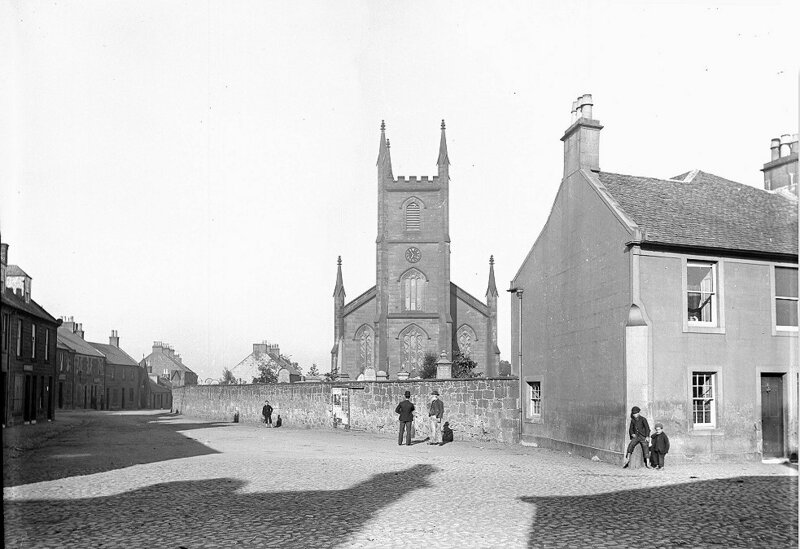 The clear image on the left shows the North Kirk, now gone. 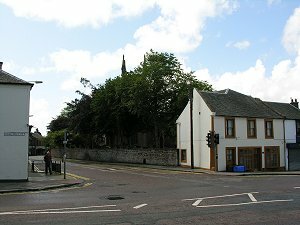 All the other houses except for the one next to the North Kirk have gone. 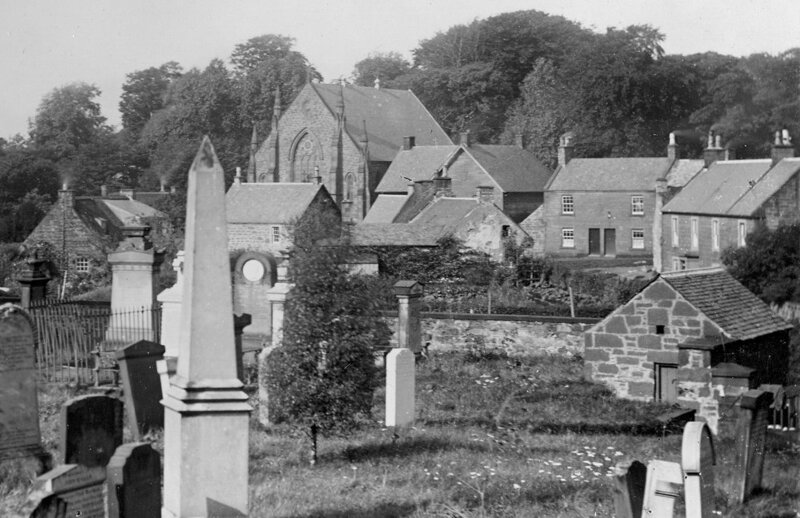 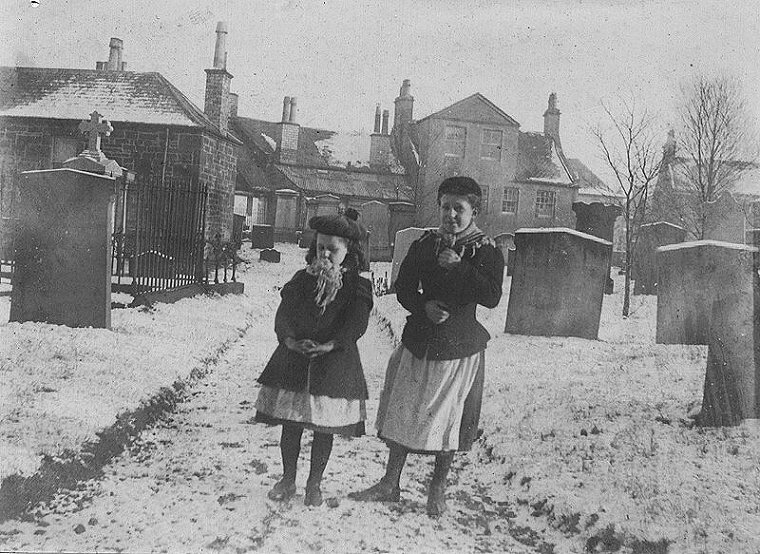 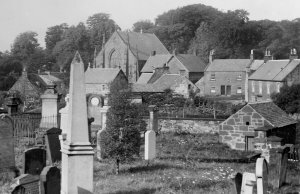 A photo taken in the old Mauchline cemetery, looking towards The Cross, right of the girls, and the back of Nanse Tinnock's, left.